"Margaret Noble" redirects here. For the artist, see Margaret Noble (artist). 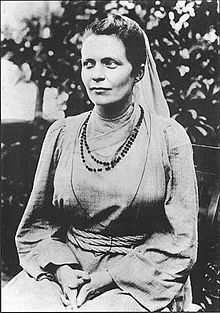 Sister Nivedita (Bengali pronunciation: [sister niːbediːtaː] listen (help·info); born Margaret Elizabeth Noble; 28 October 1867 – 13 October 1911) was an Irish teacher, author, social activist, school founder and disciple of Swami Vivekananda. She spent her childhood and early youth in Ireland. From her father, a college professor, she learned the ideal of service to mankind as the true service to God. She worked as a school teacher and later also opened a school. She was engaged to marry a Welsh youth, but he died soon after their engagement. Sister Nivedita met Swami Vivekananda in 1895 in London and travelled to Calcutta (present-day Kolkata), India in 1898. Swami Vivekananda gave her the name Nivedita (meaning "Dedicated to God") when he initiated her into the vow of Brahmacharya on 25 March 1898. In November 1898, she opened a girls' school in the Bagbazar area of Calcutta. She wanted to educate girls who were deprived of even basic education. During the plague epidemic in Calcutta in 1899, Nivedita nursed and took care of the poor patients. Nivedita had close associations with the newly established Ramakrishna Mission. Because of her active contribution in the field of Indian Nationalism, she had to publicly dissociate herself from the activities of the Ramakrishna Mission under the then president Swami Brahmananda. She was very close to Sarada Devi, the spiritual consort of Ramakrishna and one of the major influences behind Ramakrishna Mission, and also with all brother disciples of Swami Vivekananda. She died on 13 October 1911 in Darjeeling. Her epitaph reads, "Here lies Sister Nivedita who gave her all to India". Margaret Elizabeth Noble was born on 28 October 1867 in the town of Dungannon in County Tyrone, Ireland to Mary Isabel and Samuel Richmond Noble; she was named for her paternal grandmother. :91 The Nobles were of Scottish descent, settled in Ireland for about five centuries. Her father, who was a pastor, taught that service to mankind is the true service to God. The Nobles had six children of whom only Margaret (the eldest), May, and Richmond survived. When Margaret was one year old Samuel moved to Manchester, England; there he enrolled as a theological student of the Wesleyan Church. Young Margaret stayed with her maternal grandfather, Hamilton, in Northern Ireland. When she was four years old she returned to live with her parents at Great Torrington in Devonshire. Margaret was her father's favourite child. When Samuel Noble conducted services or visited the poor, she accompanied him. Margaret's father died in 1877 when she was ten years old. Margaret with her mother and two siblings returned to her grandfather Hamilton's home in Ireland. Margaret's mother, Mary took up a kindergarten course in London and became a teacher. Later, Mary helped her father to run a guest-house near Belfast. Hamilton was one of the first-ranking leaders of the freedom movement of Ireland. Besides her father's religious temperament, Margaret imbibed the spirit of freedom and love for her country through her grandfather Hamilton. Margaret was educated at Halifax College, run by a member of the Congregationalist Church. The headmistress of this college taught her about personal sacrifice. She studied subjects, including physics, arts, music, and literature. At the age of seventeen in 1884, she first started a career in teaching at a school in Keswick. In 1886, she went to Rugby to teach in an orphanage. A year later, she took up a post at the coal-mining area Wrexham in North Wales. Here, she revived her spirit of service and love for the poor which she had inherited from her father. At Wrexham, Margaret became engaged to be married to a Welsh youth who died soon after the engagement. In 1889, Margaret moved to Chester. By this time, her sister May and brother Richmond were living in Liverpool. Soon, their mother Mary joined them. Margaret was happy to be reunited with her family. Occasionally, she went to Liverpool to stay with them. Margaret resumed her studies in the field of education. She became acquainted with the ideas of the Swiss education reformer Johann Heinrich Pestalozzi and with the German Friedrich Fröbel. Both Pestalozzi and Froebel emphasized the importance of preschool education. They opined that education should begin by gratifying and cultivating the normal aptitude of the child for exercise, play, observation, imitation, and construction. A group of teachers in England was attracted to this novel method of teaching and they tried to put it into practice. Thus, the 'New Education' was advocated and Margaret, too, became a part of it. Soon, she became a favourite writer and speaker at the Sunday Club and the Liverpool Science Club. In 1891, Margaret settled in Wimbledon and helped a Mrs. de Leeuw, to start a new school in London. The new experiment in teaching gave her great joy. After a year, in 1892, Margaret started her own independent school at Kingsleygate. At her school, there were no restrictive set methods and formal learning. Children learned through play. At this time, Margaret learned to be a critic of art from one of her staff teachers, Ebenezer Cooke, a well-known art master and reformer of art education. As she gained mastery as an educator, she also became a prolific writer in paper and periodicals and a popular speaker. Soon she became a name among the intellectuals of London and became acquainted with some of the most learned and influential people of her time. Among them were Lady Ripon and Lady Isabel Margesson. They were the founders of a literary coterie, which came to be known as the Sesame Club. The Times of London of 26 October 1911, wrote about Margaret, "A trained teacher of exceptional gifts, she was one of a group of educationists who in the early nineties founded the Sesame Club." Famous writers, such as Bernard Shaw and Thomas Huxley, were some of the regular speakers at the Sesame Club. Discussions were held here on literature, ethics, politics, and other similar subjects. In 1892, when the Home Rule Bill for Ireland was before the Parliament, Margaret spoke fearlessly in favour of it. Coming from a religious background, Margaret had learned Christian religious doctrines from young. From childhood, she had learned to venerate all religious teachings. The Baby Jesus was her object of adoration and worship. However, as she bloomed into womanhood, doubt in the Christian doctrines crept in. She found the teachings were incompatible with Truth. As these doubts became stronger, her faith in Christianity was shaken. For seven long years, Margaret was unable to settle her mind and this led to unhappiness. She tried to absorb herself in church service. However, her troubled soul could not find satisfaction and she longed for Truth. During the seven years of wavering it occurred to me that in the study of natural science I should surely find the Truth I was seeking. So I began ardently to study how this world was created and all things in it and I discovered that in the laws of Nature at least there was consistency, but it made the doctrines of the Christian religion seem all the more inconsistent. Just then I happened to get a life of Buddha and in it I found that here also was a child who lived ever so many centuries before the Child Christ, but whose sacrifices were no less self-abnegating than those of the other. This dear child Gautama took a strong hold on me and for the next three years I plunged into the study of the religion of Buddha, and became more and more convinced that the salvation he preached was decidedly more consistent with the Truth than the preachings of the Christian religion. In November 1895, she met Swami Vivekananda for the first time, who had come from America to visit London and stayed there for three months. On a cold afternoon, Swami Vivekananda was explaining Vedanta philosophy in the drawing room of an aristocratic family in London. Lady Isabel Margesson, a friend of Margaret, invited Ebenezer Cooke, who was part of the teaching staff at Margaret's 'Ruskin School', to this meeting. Margaret went with him, with much curiosity and interest. Margaret did not know this evening would change her life completely. Margaret described her experience of the occasion. "A majestic personage, clad in a saffron gown and wearing a red waistband, sat there on the floor, cross-legged. As he spoke to the company, he recited Sanskrit verses in his deep, sonorous voice." Margaret had already delved deeply into the teachings of the East, and the novelty was not what she heard on this occasion, but the personality of Swamiji himself. She attended several other lectures by Swami Vivekananda. She asked a lot of questions, and his answers dispelled her doubts and established her faith and reverence for the speaker. Suppose he had not come to London that time! Life would have been a headless dream, for I always knew that I was waiting for something. I always said that a call would come. And it did. But if I had known more of life, I doubt whether, when the time came, I should certainly have recognized it. Fortunately, I knew little and was spared that torture ... Always I had this burning voice within, but nothing to utter. How often and often I sat down, pen in hand, to speak, and there was no speech! And now there is no end to it! As surely I am fitted to my world, so surely is my world in need of me, waiting – ready. The arrow has found its place in the bow. But if he had not come! If he had meditated, on the Himalayan peaks! ... I, for one, had never been here. To not a few of us, the words of Swami Vivekananda came as living water to men perishing of thirst. Many of us had been conscious for years past of that growing uncertainty and despair with regard to Religion, which has beset the intellectual life of Europe for half a century. Belief in the dogmas of Christianity had become impossible to us, and we had no means, such as we now hold, by which to separate the doctrinal shell from the kernel of reality in our faith. To these the Vedanta has given intellectual confirmation and philosophical expression of their own mistrusted intuitions. Vivekananda's principles and teachings influenced her and this brought about a visible change in her. Seeing the fire and passion in her, Swami Vivekananda could foresee her future role in India. 25 March 1898, was the holiest and most unforgettable day of Nivedita's (Margaret) life. That was the day on which her guru dedicated her to God and to the service of India. Swami Vivekananda was deeply pained by the wretchedness and misery of the people of India under the British rule and his opinion was that education was the panacea for all evils plaguing the contemporary Indian society, especially that of Indian women. Margaret was chosen for the role of educating Indian women. In his letter to Margaret, Vivekananda wrote, "Let me tell you frankly that I am now convinced that you have a great future in the work for India. What was wanted was not a man but a woman, a real lioness, to work for the Indians, women especially." Responding to Swami Vivekananda's call, Margaret travelled to India, leaving behind her friends and family, including her mother. Mombasa, the ship bringing Margaret to India, reached Calcutta on 28 January 1898. On 22 February, Margaret visited Dakshineshwar temple, the place where Ramakrishna did his sadhana. Swami Vivekananda devoted the initial few days in teaching her about India and its people, and helping her develop the love for the people; he was broadening her character. He explained India's history, philosophy, literature, the life of the common mass, social traditions, and also the lives of great personalities, both ancient and modern, to her. A few weeks later, two of Swami Vivekananda's women disciples in America, Sara C. Bull, wife of famous Norwegian violinist and composer Ole Bull and Josephine MacLeod arrived in India. The three became lifelong friends. On 11 March 1898, Swami Vivekananda organized a public meeting at Star Theatre to introduce Sister Nivedita to the people of Calcutta. In his speech, Swami Vivekananda said – "England has sent us another gift in Miss Margaret Noble." In this meeting, Margaret expressed her desire to serve India and its people. On 17 March she met Sarada Devi who greeted Margaret affectionately as Khooki (i.e. little girl). On 25 March 1898, at Nilambar Mukherjee Garden, Swami Vivekananda formally initiated Margaret in the vow of Brahmacharya (lifelong celibacy) and gave her the name of "Nivedita", the dedicated one. Swami Vivekananda said to her "Go thou and follow Him, Who was born and gave His life for others five hundred times before He attained the vision of the Buddha." ... Mr own position towards this religious treasure is that of the humblest learner, merely a Brahmacharini, or novice, not a Sannyasini or fully professed religious, without any pretentions to Sanskrit learning, and set free by the great kindness of my superiors to pursue my social, literary and educational work and studies, entirely outside their direction and supervision. You have to set yourself to Hinduize your thoughts, your needs, your conceptions and your habits. Your life, internal and external, has to become all that an orthodox Brahmana Brahmacharini's ought to be. The method will come to you, if only your desire it sufficiently. But you have to forget your own past and to cause it to be forgotten. You have to lose even its memory. Referring to Nivedita, she [Sarada Devi] said, "What sincere devotion Nivedita had! She never considered anything too much that she might do for me. She would often come to see me at night. Once seeing that light struck my eyes, she put a shade of paper on the lamp. She would prostrate herself before me and, with great tenderness, take the dust off my feet with her handkerchief. I felt that she not even hesitated to touch my feet." The thought of Nivedita opened the floodgate of her mind and she suddenly became grave... The Mother now and then expressed her feelings towards the Sister. She said at last, "The inner soul feels for a sincere devotee." Nivedita travelled to many places in India, including Kashmir, with Swami Vivekananda, Josephine Mcleod, and Sara Bull. This helped her in connecting to the Indian masses, Indian culture, and its history. She also went to the United States to raise awareness and get help for her cause. On 11 May 1898, she went with Swami Vivekananda, Sara Bull, Josephine MacLeod, and Swami Turiyananda, on a journey to the Himalayas. From Nainital, they travelled to Almora. On 5 June 1898, she wrote a letter to her friend Nell Hammond exclaiming, "Oh Nell, Nell, India is indeed the Holy Land." In Almora, she first learned the art of meditation. She wrote about this experience, "A mind must be brought to change its centre of gravity... again the open and disinterested state of mind welcomes truth." She also started learning Bengali from Swami Swarupananda. From Almora, they went to Kashmir valley where they stayed in houseboats. In the summer of 1898, Nivedita travelled to Amarnath with Swami Vivekananda. Later in 1899 she travelled to the United States with Swami Vivekananda and stayed in Ridgely Manor in Virginia. She later recorded some of her tour and experiences with her master (guru) in the book The Master as I Saw Him and Notes on Some Wanderings with Swami Vivekananda. She often used to refer to Swami Vivekananda as "The King" and considered herself as his spiritual daughter (Manaskanya in Bengali). "It is I who should do these things for you, Swamiji! Not you, for me!" was the protest naturally offered. But his answer was startling in its solemnity – "Jesus washed the feet of His disciples!" Something checked the answer "But that was the last time!" as it rose to the lips, and the words remained unuttered. This was well. For here also, the last time had come. ...But your real message came at the burning pyre itself... At 6 o'clock... as if I were twitched by the sleeve, I looked down, and there, safe out of all that burning and blackness, there blew to my feet the very two or three inches I had desired out of the border of the cloth. I took it as a Letter from Him to you, from beyond the grave. Nivedita was planning to open a school for girls who were deprived of even basic education. She toured England and America on a lecture tour designed to raise monies to establish a girls school. On 13 November 1898, on the day of Kali Puja, at 16 Bosepara Lane in the Bagbazar area of Calcutta, she started the school. The school was inaugurated by Sarada Devi, in the presence of Swami Vivekananda and some of the other disciples of Ramakrishna. Sarada Devi blessed and prayed for the school saying – "I pray that the blessings of the Divine Mother may be upon the school and the girls; and the girls trained from the school may become ideal girls. ":22 Nivedita went from home to home in educating girls, many of whom were in pitiable condition owing to the socio-economic condition of early 20th century India. In many cases, she encountered refusal from the male members of the girl's family. Nivedita had widows and adult women among her students. She taught sewing, elementary rules of hygiene, nursing, etc., apart from regular courses. She took part in altruistic activities. She worked to improve the lives of Indian women of all castes. During the outbreak of a plague epidemic in Calcutta in 1899, Nivedita nursed and took care of the patients, cleaned rubbish from the area, and inspired and motivated many youths to render voluntary service. She inserted appeals for help in the English newspapers and requested for financial support for her plague relief activities. She also organized the day-to-day activities, inspected the work and personally handed over the written instructions for the preventive measures by moving around. She was a friend to many intellectuals and artists in the Bengali community, including Rabindranath Tagore, Jagadish Chandra Bose, Abala Bose, and Abanindranath Tagore. Later she took up the cause of Indian independence. Sri Aurobindo was one of her friends as well. She took an active interest in promoting Indian history, culture, and science. She actively encouraged Dr. Jagadish Chandra Bose, the Indian scientist and philosopher to pursue original scientific research and helped him financially as well in getting due recognition when he was faced with an indifferent attitude of the British Government. Bose, whom she called "khoka" or the "little one" in Bengali, and his wife Abala Bose, were in very close terms with her. Keeping in view Nivedita's contribution to the scientific research work of Jagadish Chandra, Rabindranath Tagore said: "In the day of his success, Jagadish gained an invaluable energizer and helper in Sister Nivedita, and in any record of his life’s work her name must be given a place of honour." Her identity as both a westerner by birth and a disciple of Swami Vivekananda enabled her to do several things that might have been difficult for Indians. For example, she promoted pan-Indian nationalism. Nivedita was a prolific writer and extensively toured India to deliver lectures, especially on India's culture and religion. She appealed to the Indian youth to work selflessly for the cause of the motherland along the ideals of Swami Vivekananda. Initially, Nivedita, like contemporary intellectuals from Europe, was optimistic about British rule in India and believed that it was possible for India and England to love each other. However, in the course of her stay, she came to witness the brutal side of the British rule, the repression and oppression and the division between the ruling elite and the ruled; she concluded that it was necessary for India to gain independence to prosper. Therefore, she devoted herself wholeheartedly to the cause of opposing the British rule. In February 1902, Mahatma Gandhi, or Mr.M.K.Gandhi as he was known then, visited Nivedita in Calcutta. After Vivekananda's death, being acutely aware of the inconvenience of the newly formed Ramakrishna Mission on account of her political activities, she publicly dissociated herself from it. However, until her last days, she had a very cordial relationship with the brother disciples of Swami Vivekananda like Swami Brahmananda, Baburam Maharaj (Swami Premananda) and Swami Saradananda, who helped her in her charitable and educational activities in every possible way; she was very close to the holy mother, Sarada Devi. Nivedita had initially worked with Okakura of Japan and Sarala Ghoshal who was related to the Tagore family. She later started working on her own and maintained a direct relationship with many of the young revolutionaries of Bengal, including those of Anushilan Samity, a secret organization. She inspired many youths in taking up the cause of freeing India through her lectures. She also exposed Lord Curzon after his speech at the University of Calcutta in 1905 where he mentioned that truth was given a higher place in the moral codes of the West, than in East. She undertook her own research and made it public that in the book Problems of The Far East by Curzon she had proudly described how he had given false statements about his age and marriage to the president of the Korean Foreign Office to win his favour. This statement when published in newspapers like Amrita Bazar Patrika and The Statesman caused a furore and forced Curzon to apologize. The whole history of the world shows that the Indian intellect is second to none. This must be proved by the performance of a task beyond the power of others, the seizing of the first place in the intellectual advance of the world. Is there any inherent weakness that would make it impossible for us to do this? Are the countrymen of Bhaskaracharya and Shankaracharya inferior to the countrymen of Newton and Darwin? We trust not. It is for us, by the power of our thought, to break down the iron walls of opposition that confront us, and to seize and enjoy the intellectual sovereignty of the world. Sister Nivedita remains one of the most influential female figures of India. Her book Kali, the Mother influenced Abanindranath Tagore who painted Bharat Mata. In 2010, the office of the board of West Bengal Board of Secondary Education in Salt Lake City, Kolkata was named after Sister Nivedita. The Sister Nivedita Academy, an institution dedicated to her memory has been established in Chennai, Tamil Nadu. Several schools and colleges have been named after her. In 1968, the Indian Government issued a postal stamp in her memory. The Nivedita bridge near Dakhineswer, Kolkata is named in her honour. In 2015, a new Government Degree College at Hastings House, Alipur, Kolkata was named after Sister Nivedita. Sister Nivedita was one of the important influences on Jagadish Chandra Bose. She supported him by organizing the financial support and editing his manuscripts, she made sure that Bose was able to continue with and share his work. Her works included The Web of Indian Life, which sought to rectify many myths in the Western world about Indian culture and customs, Kali the Mother, The Master as I Saw Him on Swami Vivekananda, Notes of Some Wanderings with the Swami Vivekananda on her travels from Nainital, Almora and other places with Swamiji, The Cradle Tales of Hinduism on the stories from Puranas, Ramayana and Mahabharata, Studies from an Eastern Home, Civil Ideal and Indian Nationality, Hints on National Education in India, Glimpses of Famine and Flood in East Bengal—1906. Kali the Mother, Swan Sonnenschein & Co.,. 1900. Civic & national ideals. Udbodhan Office. 1929. A newly annotated edition of The Ancient Abbey of Ajanta, that was serialized in The Modern Review during 1910 and 1911, was published in 2009 by Lalmati, Kolkata, with annotations, additions, and photographs by Prasenjit Dasgupta and Soumen Paul. Another collection of essays relating to Buddhism has been published by New Age Publishers of Kolkata titled Studies in Buddhism, that has been compiled and annotated by Prasenjit Dasgupta and Soumen Paul. In 1952, Ramakrishna Mission Sister Nivedita Girls' School during its Golden Jubilee Celebration, decided to bring out a biography of Sister Nivedita in English and Bengali. Though there were some biographies in English and Bengali before this, they lack in historical facts. The historical account of Sister Nivedita's life in Bengali was written by Pravrajika Muktiprana of Sri Sarada Math and was published in 1959. The materials for the biographies were sourced from Sister Nivedita's own works, letters and diaries, references made to her by some of her contemporaries, and interviews with those who had worked with her and her own students. Later, in 1961, the English version of the book written by Pravrajika Atmaprana was published as Sister Nivedita of Ramakrishna-Vivekananda. Since then, the books had seen several revisions. Letters of Sister Nivedita were first published in two volumes in 1960. There were more than 800 letters, half of which were written to Miss Josephine MacLeod. These letters vibrant with her thoughts and feelings cast a lot of light on the versatile genius of Nivedita. In 1975, Barbara Fox published in London a biography of Sister Nivedita titled Long Journey Home. This work attempt to gauge Nivedita's work from an English woman's point of view. Nivedita Lokmata in Bengali was published in three volumes by Sankari Prasad Basu in 1968, 1987, and 1988 respectively. ^ a b c d Constance Jones; James D. Ryan (2007). Encyclopedia of Hinduism. Infobase Publishing. pp. 316–317. ISBN 978-0-8160-7564-5. ^ "Hindus want national holiday on October 13 to mark Sister Nivedita's 100th death anniversary". Hindustan Times (Highbeam). Archived from the original on 29 March 2015. Retrieved 9 June 2012. ^ Margaret Elizabeth Noble. Studies From An Eastern Home. Forgotten Books. p. 1. ISBN 1-60506-665-6. ^ Ananda Kentish Coomaraswamy; Whitall N. (INT) Perry (2011). The Wisdom of Ananda Coomaraswamy: Reflections on Indian Art, Life, and Religion. World Wisdom, Inc. pp. 129–. ISBN 978-1-935493-95-2. ^ a b c Compiled (2008). Awakening Indians to India (Paperback). Chinmaya Mission. pp. 370–. ISBN 978-81-7597-434-0. ^ a b c Dedicated : a biography of Nivedita. [S.l. ]: Arcana Pub. 1999. ISBN 0910261164. ^ a b c d e f g h i j Nivedita of India (PDF) (1st ed.). Kolkata: Ramakrishna Mission Institute of Culture. 2002. p. 2. ISBN 81-87332-20-4. ^ "As a Teacher". Freeindia.org. Retrieved 12 June 2012. ^ Aruna Goel; S. L. Goel (2005). Human Values and Education. Deep & Deep Publications. p. 243. ISBN 978-81-7629-629-8. ^ M. G. Chitkara (2001). Women & Social Transformation. APH Publishing. pp. 416–. ISBN 978-81-7648-251-6. ^ Rolland, Romain. The Life of Vivekananda and the Universal Gospel. Advaita Ashrama. p. 77. ISBN 81-85301-01-8. ^ "Letters of Sister Nivedita—Frank Parlato Jr". Vivekananda.net. 19 August 1999. Retrieved 12 June 2012. ^ "The Swami and the Sister". IIAS. Retrieved 21 June 2012. ^ G. S Banhatti (1995). Life And Philosophy Of Swami Vivekananda. Atlantic Publishers & Dist. pp. 39–. ISBN 978-81-7156-291-6. ^ a b Nupur Chaudhuri (1992). Western Women and Imperialism: Complicity and Resistance. Indiana University Press. p. 125. ISBN 978-0-253-20705-0. ^ a b Helen Rappaport (2001). Encyclopedia of Women Social Reformers. ABC-CLIO. pp. 651–. ISBN 978-1-57607-101-4. ^ "Restoration bid for Sister Nivedita's house faces hurdle". Times of India. 24 July 2011. Retrieved 5 October 2012. ^ "The School's Ideals". RKSM Sister Nivedita Girls School. Retrieved 9 October 2012. ^ Ramananda Chatterjee (1938). The Modern review. Prabasi Press Private, Ltd. pp. 78–79. ^ Economic and political weekly. Sameeksha Trust. 1990. ^ Maithreyi Krishnaraj (23 April 2012). Motherhood in India: Glorification Without Empowerment?. CRC Press. p. 240. ISBN 978-1-136-51779-2. ^ Bonnie G. Smith (23 January 2008). The Oxford Encyclopedia of Women in World History. Oxford University Press. pp. 3–. ISBN 978-0-19-514890-9. ^ Chakrabarti, Mohit (1998). Swami Vivekananda, poetic visionary. New Delhi: M.D. Publications. p. 80. ISBN 81-7533-075-9. ^ a b Sinha, Avijit (28 October 2011). "Revamp plea for Sister Nivedita's last abode". Telegraph, Calcutta. Calcutta, India. Retrieved 5 October 2012. ^ "Sister Nivedita's epitaph". Darjeeling Government. Retrieved 9 October 2012. ^ Mohit Chakrabarti (1998). Swami Vivekananda, Poetic Visionary. M.D. Publications Pvt. Ltd. pp. 80–. ISBN 978-81-7533-075-7. ^ Chakrabarti, Arindam (23 October 2011). "Not Earth's Girl". Telegraph, Calcutta. Calcutta, India. Retrieved 5 October 2012. ^ "Madhyamik to breach million mark". Telegraph Calcutta. 19 November 2010. ^ "Sister Nivedita Academy". Retrieved 5 October 2012. ^ "Sister Nivedita commemorative stamp". Indian Post. Retrieved 12 October 2012. ^ "Mamata Banerjee lays foundation for Soujanya". Retrieved 12 September 2015. ^ "The Scientist and the Nun: How Sister Nivedita Made Sure J.C. Bose Never Gave Up" – via thewire.in. ^ Adwaita P. Ganguly (1 December 2001). Life and Times of Netaji Subhas: From Cuttack to Cambridge, 1897–1921. VRC Publications. pp. 35–. ISBN 978-81-87530-02-2. Atmaprana, Pravrajika (1992) . Sister Nivedita of Ramakrishna-Vivekananda. Sister Nivedita Girls' School, Calcutta. Letters of Sister Nivedita Vol. 1 Vol. 2. Basu, Sankari Prasad (Ed.). 1960. Nababharat Publishers. Gupta, Indra (2003). India's 50 Most Illustrious Women. New Delhi: Icon Publications. 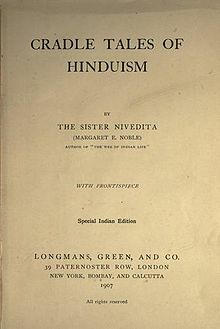 ISBN 978-81-88086-03-0 Chapter 23 "Sister Nivedita"